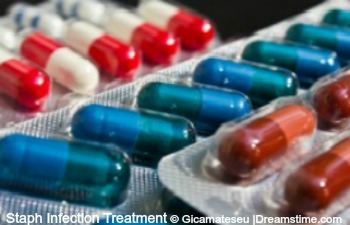 Antibiotics are the first choice for staph infection treatment. This is the treatment used when your eczema gets infected with the Staphylococcus aureus bacteria. Otherwise known as a Staph aureus infection. Topical antibiotics are a first-line eczema treatment. When an infection first occurs it usually affects a smaller area. Topical antibiotics are ideal for this, as it is used directly on the affected area. This enables the treatment to be absorbed into where it is needed. 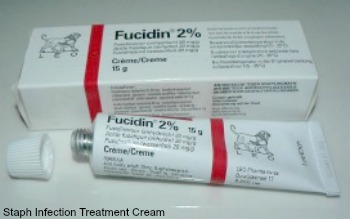 Fucidin is available as a cream or an ointment. The cream is Fusidic acid 2% cream. The active ingredient is Fusidic acid. It kills or stops the growth of the bacteria. The ointment is Fusidic acid 2% ointment. The active ingredient is sodium fusidate. The cream and the ointment can both be used on adults, and children aged 1 month and over. Bactroban is available as an ointment. It is known as Mupirocan 2% ointment. Mupirocan is the active ingredient. It kills the bacteria. This can be used on adults, and children aged 1 year and over. The above staph infection treatment should only be used for a maximum of 2 weeks. They should also only be applied thinly to the affected area, 3 times a day. If you have completed a course of topical antibiotics and the infection has not improved or cleared then another type of topical treatment can be tried. They are known as a combination cream or ointment. This staph infection treatment contains an antibiotic as well as a corticosteroid. Fusidic acid enters the cells of the bacteria. There they are able to stop the production of bacteria. Making them unable to multiply. So helping to treat the infection. Hydrocortisone reduces the inflammation of the skin. It is a mild corticosteroid. Bethamethasone valerate is a strong corticosteroid. Again, it should not be used for longer than 2 weeks. And you should avoid using it on your face. Oral antibiotics are used as a staph infection treatment when the infection is more severe or more widespread. They come as a tablet or capsule. Flucloxacillin is available as an oral solution or capsules. It contains penicillin. It works by stopping the growth of, and killing bacteria. The oral solution is usually given to children, though adults can take it. It can be taken by children aged from 1 month old. The dosage taken depends on the age of the child. As they get older the amount taken and the strength of the solution increases. It is usually taken for a 7 day period. The capsules can be taken by anyone over the age of 12 years. They are available in two different strengths. Both are taken for a 7 day period. Erythromycin is a penicillin free alternative to Flucloxacillin. It is prescribed if you have an allergy to penicillin. Mainly taken as an oral solution or tablets. The oral solution tends to be given to children. It can be taken from the age of 1 month old. The tablets can only be taken by children aged 12 years and over. A course of treatment is usually taken for 7 days. When you are given a course of antibiotics always finish the whole course. This will help with limiting a recurrence of the infection. It also reduces the chance of the body becoming immune to the antibiotic. Although using them for a prolonged period can also cause the same immunity. When you are prescribed antibiotics it is recommended that you tell your doctor of any other medications you are taking. Antibiotics, particularly oral antibiotics, can react with other medication. Especially the contraceptive pill. You are unlikely to suffer from any side effects from using a topical antibiotic. Though if it is used for a long period of time, or repeatedly, then you may become allergic to it. Just a quick note about taking antibiotics and alcohol consumption. When taking some types it is advised not to drink alcohol. But while taking Flucloxacillin or Erythromycin it is safe to do so. For any reassurance just check with your doctor of the pharmacist. I have been prescribed both a topical and oral antibiotic at some point. Both more than once. Usually for a cream I have been prescribed Fucidin. My infections have tended to start on my hands. If I catch it quick enough then the cream does the trick. I notice a difference quickly. If my infection was more severe or widespread I was usually prescribed Flucloxacillin. With both treatments I have always used eczema moisturizers and topical corticosteroids. 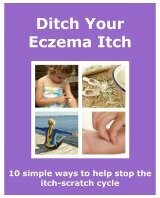 It is always important for me to use other first line eczema treatments. The moisturizers limit any damage. The corticosteroid helps to reduce the inflammation. They both help reduce the itch. This means I don’t scratch, so the infection clears better and quicker. The times when an infection seems to make my eczema unmanageable, staph infection treatment has been invaluable. Used properly, and alongside other treatments, they can help manage your eczema, They wont cure it, but they can make it a lot easier to live with.